And afterward, dinner at Gemma! We came home last night to find the charming flyer at right tacked to our building's front door (note: We do not live on the Bowery). 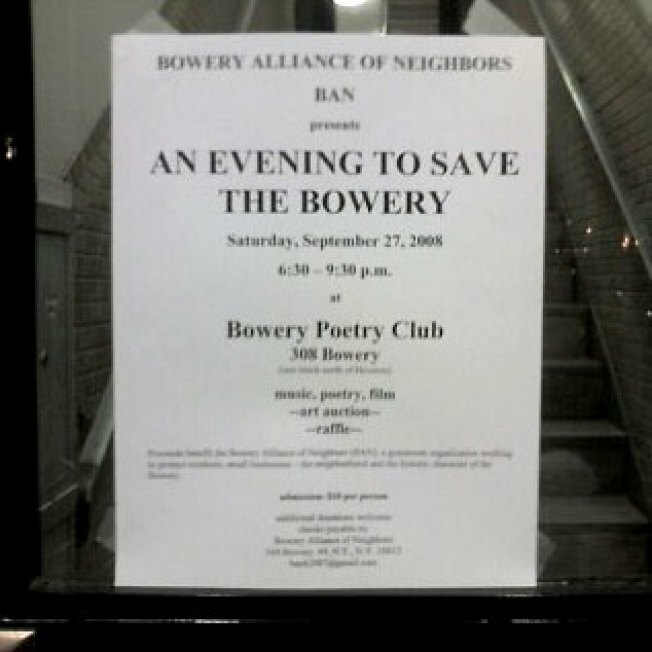 And what, exactly, about the Bowery are they saving? Oh, just the usual: "residents, small businesses — the neighborhood and historic character of the Bowery." Or, roughly translated, residents, small businesses — the neighborhood and the historic character of the Bowery must be saved from the Box, Freemans, the Bowery Hotel, R Bar, Bowery Electric, Antik, the Cooper Square Hotel, BLVD, King's Cross, Marion's, Slainte, Butter, Double Crown, Madam Geneva, Sweet & Vicious, Von, B Bar, Phebe's, and, of course, John Varvatos. Oh, and Boulud and McNally. Are we forgetting anyone? Probably.